Castillo de San Marcos National Monument, St. Augustine, Florida. 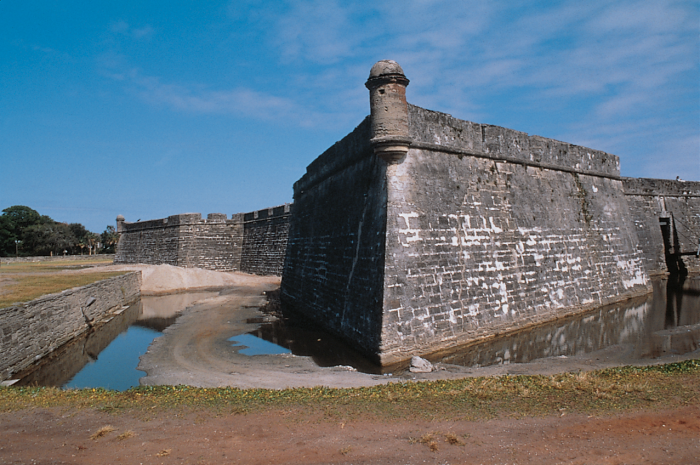 Taken in 1995, this view looks across the moat toward the southwest bastion, where several major cracks are visible. The Castillo de San Marcos National Monument, St. Augustine, Florida, is a 17th Century historic, cultural, structural, and civil engineering landmark. The Park Superintendent, Gordie Wilson, together with the Southeast Region of the National Park Service, has commenced a long-range monitoring effort at the fort. The goal is to better understand the causes of movement—and the resulting cracks—that have plagued areas of the fort walls for two hundred years. Monitoring equipment was assembled from several vendors. Campbell Scientific provided the datalogger, multiplexers, weather stations, and soil moisture probes. The equipment was integrated with crack and tilt sensors manufactured and installed by Geokon (Lebanon, NH). AMJ Equipment (Lakeland, FL) and PSI Engineering (Jacksonville, FL) provided technical and installation assistance. To reduce the installation’s aesthetic impact on the park, cables were concealed in custom conduit with the help of the park’s maintenance staff. The sensors are measured and the data are stored by the CR10X at 5 a.m. and 5 p.m. On a quarterly basis, the data stored in the CR10X is downloaded via phone modem to computers located in the offices of the engineers and architects for analysis and interpretation. The project is scheduled to collect data for five to ten years.